We supply and export a vast range of Test Sieves which are designed as per British Standard / ASTM specification. The test sieves have clear rigid design with minimum weight and is free from corners. The test sieves are supplied in various sizes and openings as is demanded by the industry. The sieves are also being supplied in full stainless steel or brass frame with stainless steel mesh. We also supply Electro magnetic Sieve Shaker. It is a digital model and produce tri-dimensional movement. The customization is also provided by us as per the requirements of our clients. Size 4" / 8" / 12" / 18"
Test Sieves offer the highest accuracy and reliability of sieve analysis. test sieves are designed and manufactured in all respects as per British Standard specification and available in ASTM also. The frame is made of spun stainless steel without any joint in it. A clear rigid design of minimum weight and free from corners where the material could be lodged. Stainless steel SS 304 quality sieve cloth is used for highest performance. An essential feature of the test sieves is that the mesh should be flat and uniform and with permanent tension around the whole circumference. The same is fully observed in Test Sieves. Micro test sieves are available in one piece brass frame of 3,4 and 6 inch diameter with suitable lid and receiver. Coarse and fine test sieves 8, 12 and 18 inches in diameter with Lid and receiver assembly are also available. For samples that need to be separated with the help of wet washing. Available in 8 inch diameter by 4 or 8 inch deep with brass frames. A complete range of aperture sizes are available. There is no national or international specification for wet washing sieves. sieves will nest with sieves of similar diameter and can be fitted with mesh to any desired specification. 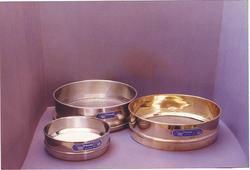 Lids and receiving pans are available in stainless steel or brass in 8 and 12 inch diameter. We are successfully catering to the international markets of South-East Asia, SAARC Countries, Parts of Europe and Africa. The EMS-8 is a Micro controller based Electromagnetic Sieve Shaker. The movement produced is tri-dimensional, combining a vertical movement with a rotation of the material to be shifted on the surface of the sieve. The shaker is powered by an electromagnetic drive which has no rotating parts, making it maintenance free and extremely quiet in operation. The vibratory action produced by the power unit moves the sample all over the sieve in a unique way producing faster, more efficient sieving, while the rapid vertical movements also help to keep the apertures free from blocking. The EMS-8 is very suitable for sieving of high density products and for dry and wet sieving analysis. The unit has been designed for user friendly operation and supports a menu driven 16x2 character LCD display. The unit is robustly built and can be used in laboratories or at site. It is compact and portable. 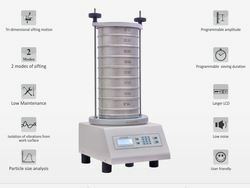 The EMS-8 is ideally used as a particle profile / size analyzer for the pharmaceutical and chemical industries by governing the separation of particles according to their sizes. Particle size is one of the most important properties of any solid material and the EMS-8 is engineered for quick and accurate particle analysis. The instrument can handle pharmaceutical powders and granules as well as chemical processing materials, dyes, chemicals and is also used by the food processing industry. It is also used to test sand, cement and gravel. The sieve shaker's micro controller is used to set both the process time and the amplitude setting. The unit has 15 levels of amplitude upto a maximum of 2 mm as recommended by USP. The top plate of the sieve shaker has clearly marked calibrated lines to aid visual inspection of the amplitude. The unit has 2 modes of operation - continuous and intermittent. Intermittent operation helps to clear blocked apertures. The EMS-8 sieve shaker offers total flexibility enabling optimum settings to be established for virtually any material under test. 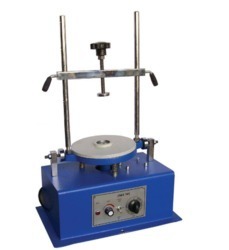 The unit is compact and is used in laboratories. The instrument is fitted with a special clamping device that ensures that the sieves are held firmly and allows them to be quickly removed and replaced. Non-metallic springs and anti-vibration mountings are fitted to isolate vibrations from work surfaces and reduce noise levels. For Detailed Specifications see attachment. Used in Research and developement, quality control of Raw Materials as well as in production monitoring. The heavy cast iron unit consists of a motor that actuates an eccentric weight, thus producing Uniform motion on the sieve table, which is equally balancved on Helical springs. The uniform speed is controlled by a speed regulator and imported mechanical timer sets required time for sieving analysis. Variable amplitude on sieve table can be adjusted with the help of speed regulator. Looking for Sieve Filtration System ?